It's not often that I get to sleep in a teepee, but that's just what happened on my trip to Bryce. I never like to plan things out I find it too restrictive. I like to follow the weather and the weatherman said that a storm was brewing in Bryce National Park. So packed up and headed from Moab down to Bryce. Now a teepee isn't great during a storm, but I didn't have a lot of choices since all the rooms both at the park and in town were full. Tourists were everywhere. I'd say about 50 percent of the people visiting were French and about 20 percent were either German or Italian. There were quite a few Japanese too, but not many Americans. The Europeans absolutely love Bryce! As for the teepee it was fun. It didn't rain while I was there, but I did get the clouds I was hoping for. Yippee kay ay! I went to Bryce once before and I really liked Bryce Point. Sunrise is the best time to photograph Bryce. I was the first one to get there. Many others showed up later. I imagine there were many more at Sunrise and Sunset Points. 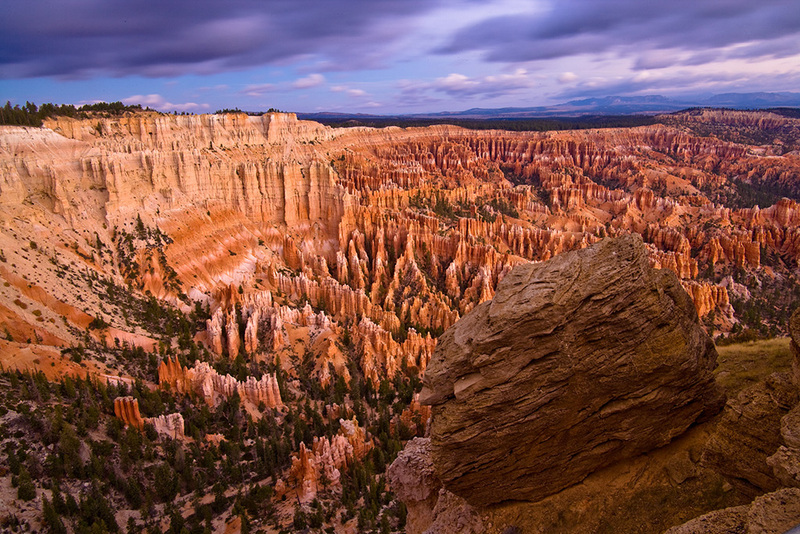 If you want to zoom in on some of the Hoodoos Sunrise and Sunset Point are the best, but if you want the whole enchilada I prefer Bryce Point. 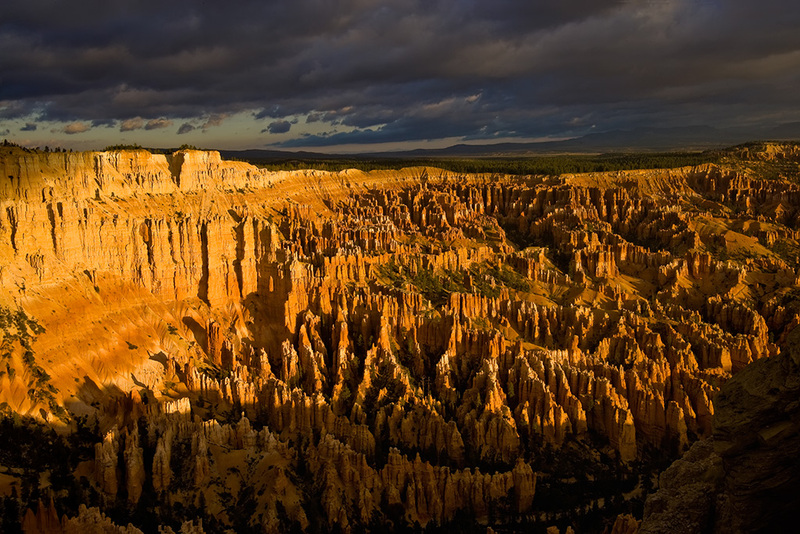 As for Bryce Point I like to photograph it just before the sun creeps over the horizon. It gets very contrasty after the sun comes up. It can be done if you have enough clouds softening the light. As for Sunrise and Sunset Point I like backlight. You might think that the face of the Hoodoos would be too dark, but they're so close together that you get light bouncing in from the other Hoodoos. You just have to pick out the ones that have that glow. It's truly amazing in person. The light show continues for some time after sunup. The shot here is from a previous trip because I just ran out of time on this trip and my back can only take so many days of sleeping on the cold hard ground. 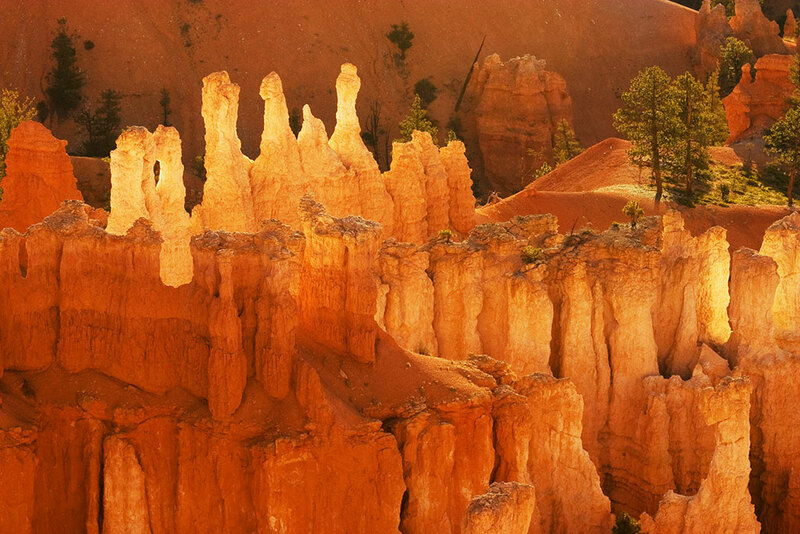 I hope you can make it to Bryce it's wonderful visit with or without a camera. There's some great trails to explore and if you like to gamble it's not too far from Vegas. 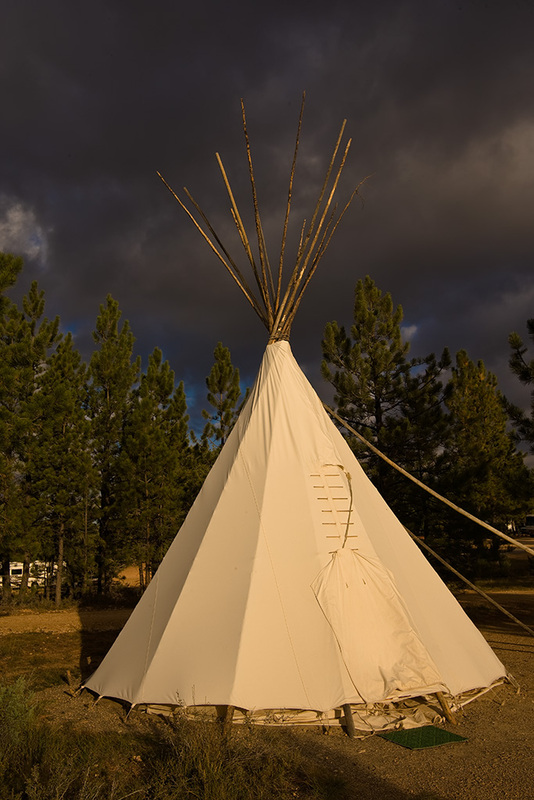 If you really like to gamble try the teepee.